Neither pestilence, starvation, nor betrayal can stop Ross Poldark from fighting for justice in his native Cornwall. 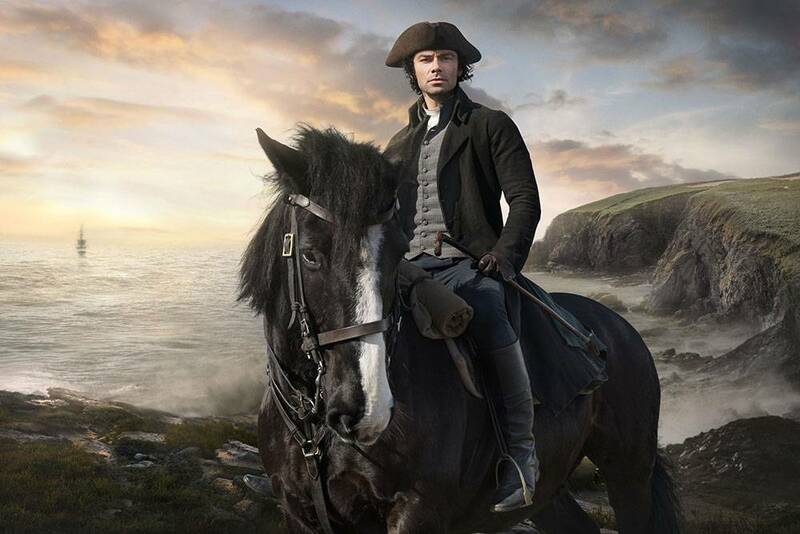 Aidan Turner (The Hobbit) returns as the ex-officer, class warrior, lover, and mining entrepreneur, called by The New York Times “the noblest, hottest, most down-to-earth hero.” Poldark, Season 2 airs on MASTERPIECE in nine gripping new episodes, this fall on PBS. Also back is co-star Eleanor Tomlinson (Death Comes to Pemberley), playing Demelza, the miner’s daughter who is Ross’ equal in passion, wit, and daring—which is, of course, why they marry. intriguing ambiguity by Kyle Soller (Anna Karenina). Also back are Jack Farthing (Poirot) as George Warleggan, the arch-villain who would rather see Ross dead, a situation he does his best to arrange; along with Philip Davis (White Teeth) and Beatie Edney (Miss Pettigrew Lives for a Day) as Ross’ exasperating servants, Jud and Prudie Paynter. New this season—or thrust into prominence from last—are Gabriella Wilde (Endless Love) as Caroline Penvenen, a flirtatious young heiress under the watchful eye of her rich uncle, Ray, played by John Nettles (Midsomer Murders); Luke Norris (Titanic) as earnest young doctor Dwight Enys, who only has time for his patients— and for Caroline; and Henry Garrett (Zero Dark Thirty) as Captain McNeil, Ross’ old comrade from the war, now hunting smugglers and an opportunity to woo a certain married lady. All of these characters inhabit the imaginative world created by Winston Graham in his bestselling “Poldark” novels, published between 1945 and 2002. Comprising an even dozen volumes, the epic commences in 1783, as British officer Ross Poldark returns to Cornwall, fresh from the American Revolutionary War. MASTERPIECE’s Poldark, Season 2 takes the plot into Graham’s fourth volume, “Warleggan”. Viewers of the first season will recall that Ross shocks his relatives and neighbors when he shows up from America, since all had presumed him dead. Then he sets about upending their lives—threatening the copper mining interests of his uncle and cousin, Charles and Francis Poldark, and the rival operation of upstart George Warleggan. He is also ensnared in a romantic web that connects him, Francis, and George to the beautiful Elizabeth. Nevertheless, Ross happily marries Demelza and they have a daughter. But in the final episode of Season1, an epidemic takes the child away, and a shipwreck and drowning are blamed on Ross. So at the start of Season 2, Ross stands accused of murder and “wrecking”— luring a cargo ship to the rocks for plunder. It’s a capital offense, the judge is unsympathetic, hostile witnesses have been bribed and Ross appears headed for the gallows. It’s just the first in a string of suspenseful episodes every bit as precipitous as the steep cliffs of Cornwall. Poldark, Season 2 is a Mammoth Screen production for the BBC and MASTERPIECE. Based on the novels by Winston Graham, it is written and created for television by Debbie Horsfield, produced by Margaret Mitchell and directed by Will Sinclair, Charles Palmer and Richard Senior. The executive producers are Debbie Horsfield, Karen Thrussell and Damien Timmer for Mammoth Screen, Elizabeth Kilgarriff for the BBC and Rebecca Eaton for MASTERPIECE. It is distributed internationally by ITV Studios Global Entertainment.